Coat inside of the casserole dish with nonstick cooking spray. Fill a large sauce pan with 6 cups water, chicken bouillon, onion, garlic and bay leaf. Bring to a boil. Add chicken breasts, reduce heat, and cook 15 minutes. Drain and cut into cubes approximately 1/2 inch in size; set aside. Place broccoli in a heat safe container. Pour boiling salt water over broccoli; drain. In a mixing bowl, combine mayonnaise, cream soup, lemon juice, and curry powder. 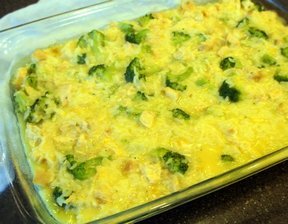 Arrange broccoli in bottom of prepared baking dish. 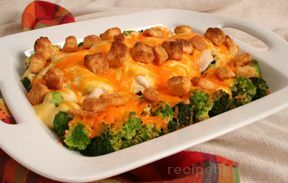 Place chicken on top and cover with sauce, cheese, and croutons. Drizzle melted butter over the entire casserole. 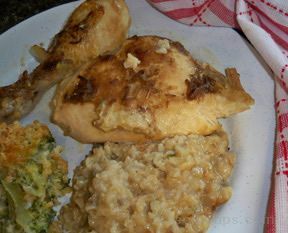 Serve the casserole over a bed of rice if desired. TIP: For a quick and easy alternative, purchase a rotisserie chicken; remove the skin; and use the breast, thigh, and leg meat. You can also purchase microwave ready bagged vegetables that reduce the preparation and cooking time for this recipe. "We loved this recipe. It was great served over brown rice. 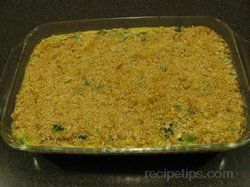 The casserole was easy to make and then I just had to make the rice for a complete meal." "Used sour cream instead of mayo!!! AWESOME!!!! When I have some mayo I will try it that way also to compare. So great a little bit more work than I usually will put in (with 5 kids and a dog) but well worth it! I will definitely make this again! :)"
"We had this with rice. I used onion powder instead of the onion & I didn't have a bay leaf. Also, you may need to let the dish stand for 5 min. after cooking so the water from the chicken & broc will absorb. Love this dish!" "I added a little more mayo and curry than recipe called for, but dish was superb"